The Greeley Tribune published an excellent article that we wanted to share with you. Hanging Christmas lights this season? Here's a few helpful hints on how to hang lights and protect your shingles. A good question to consider while implementing your holiday decoration plan is, “Would Clark Griswold do this?” Generally, if the answer is yes, do not proceed—especially when it comes to stapling lights to your roof. The best way to hang holiday lights is by stringing them through plastic clips attached to your shingles, gutters and eaves. Plastic clips designed for use with holiday lights are easy to install and remove, affordable and readily available at most home improvement or large retail stores. Using plastic clips instead of traditional nails or staples will prevent you from puncturing your shingles or gutters; even the tiniest hole in a shingle can allow moisture to seep in and potentially damage the roof. Using nails or staples can also puncture the wires of your lights, or wear down their insulating coating, potentially causing electrical problems. 1. 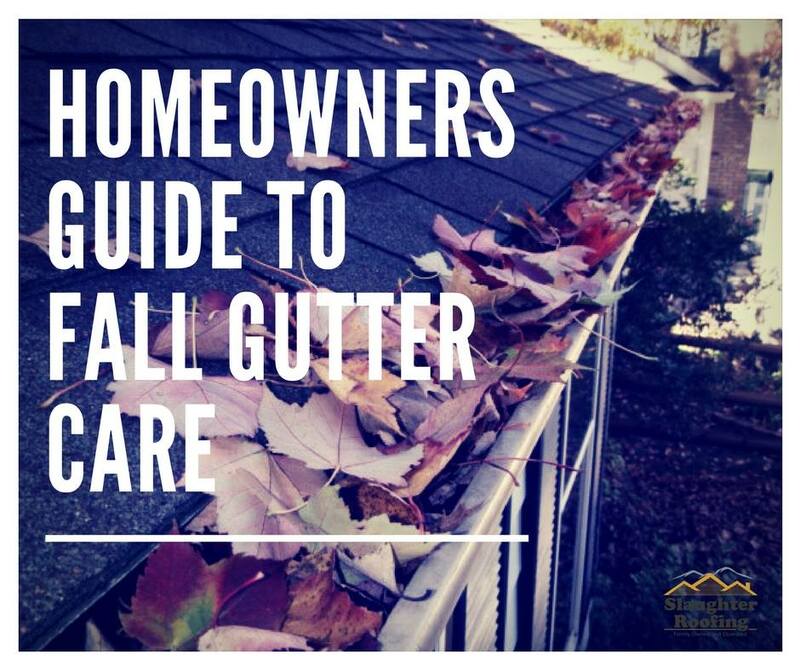 Why Clean Gutters in the Fall? Completing the task of clearing out your gutters is especially important now, in the fall, because free-flowing gutters help your roof move ice-melt away from the gables, where it might otherwise lead to ice dams. Ice dams often occur when trapped ice melts then rapidly freezes again, creeping up under shingles and into the sensitive underlayment materials below. Ice dams are infamous for causing considerable damage and debris in your gutters can exasperate the problem. 2. Don't Forget About the Downspouts! Downspouts are just as important as the gutters themselves, as they’re designed to lead water away from both your home’s foundation as well as its more sensitive wooden elements. If a downspout becomes clogged with debris, it won’t be able to redirect water and snow-melt fast enough to keep it from leaking into your home. Check the area where a downspout exits from the bottom to the gutter for loose or missing rivets, replacing any problem areas with new rivets. Improperly attached downspouts can damage siding if they tear loose. Water and ice can be heavy, so make sure your gutters are securely attached through the fascia board to the rafter behind it using the appropriate hardware. Neglected gutters clogged with ice and rotting vegetation have been known to tear loose from their moorings, damaging houses and even injuring persons, pets, or property located below. 4. I Finished Cleaning My Gutters, Now What? Once your gutter cleaning duties are finished, grab an umbrella and go outside on the next rainy day to check for overflows, blockages, or other problem areas. Hopefully, you won’t find any! For professional help with cleaning or repairing your gutters, contact the roofing experts at Slaughter Roofing and C&S Gutters here in Greeley. We have received several phone calls over the past few days regarding a tactic some roofing companies are using to get your business. These companies are inspecting roofs and then “requiring” homeowners to sign a document stating that it is “only permission their company needs” to get on your roof. However, this document is actually a contract and you are entering into an agreement for that company to do your roof and any other work that needs to be completed. This is a scam. Those contracts likely contain a “cancellation fee” if you decide not to use that company. Many residents we have spoken to were unaware of what they were signing and now feel stuck and are being pressured with legal action if they do not want to use that company. There are steps you can take to get out of this and we can help (even if you choose not to use us). Don’t Sign Anything. Always do your research and do not give into high pressure sales tactics like this. A reputable company will NEVER ask you to sign something during an inspection. Greeley is home not only to our business but to our neighbors, friends, and family and it is important we alert you of this scam. Only allow local and well established contractors on your roof and don’t be pressured by door knocking companies. Please let us know if we can help. 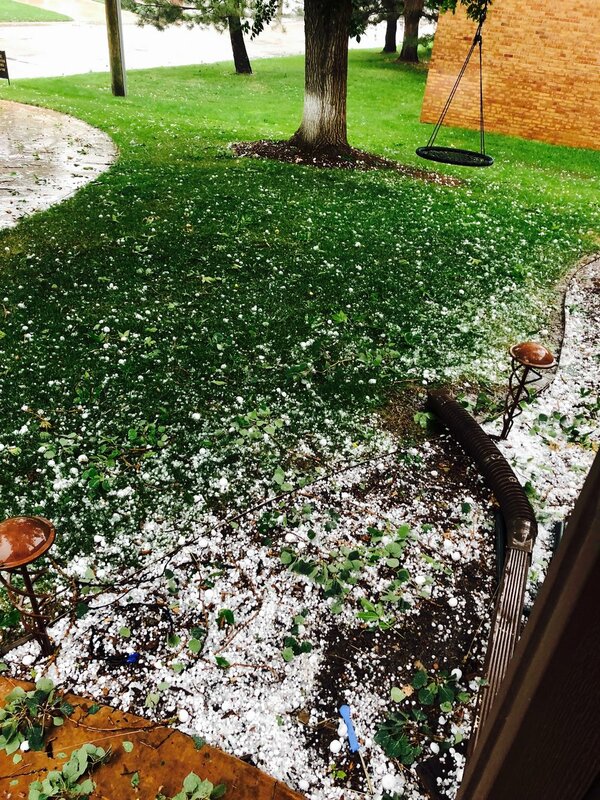 The hail storm on July 29th was a bad one. We've had reports of large marble to golf ball sized hail. We hope everyone is safe. Broken Items: If you have experienced any broken windows or skylights use caution when trying to do any temporary repairs. Give our office a call if they are located in areas you are unable to access easily. Document any other damage you may find over the next couple of days and determine if you have any emergency repairs that need addressed. Door Knocking Companies: Just like the June 19th storm, this storm was large enough to attract out-of-town and out-of-state contractors. 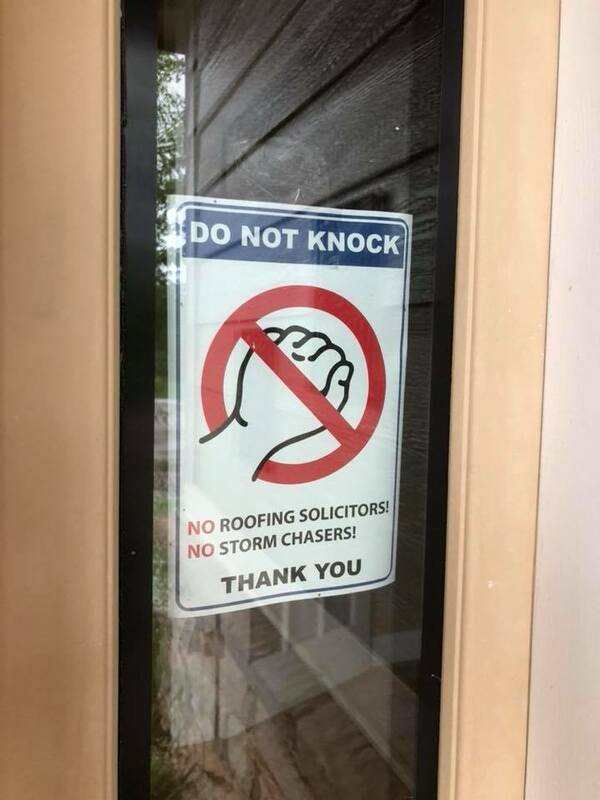 Download our "No Knocking Sign" and only allow local and trusted contractors on your roof. Contacting Slaughter Roofing: Our office is still receiving a high volume of calls from the last storm and if we are unable to receive your call -- please leave us a message and we will get right back to you. Our office staff is the best and will be glad to return your call and answer any questions you may have. Be Patient: Local quality contractors are busy and your insurance company understands this. Many companies give 1-2 years to repair any damages. Don't be pressured into getting your roof done right away. Thank you to Steve Pratz, Brian Miller, and Mike Montoya for the pictures. Over the past week, our technicians have looked at several hundred roofs. Here is some information and FAQ regarding how we determine if your roof has sustained enough insurable damage to file a claim. The Slaughter Roofing Cancer Tennis tournament wrapped up over the weekend. A huge THANK YOU to all the participants, volunteers, sponsors and fans who came out. We'd also like to thank the Greeley Tribune for their awesome coverage! The Slaughter Roofing Tennis Tournament is underway! The Greeley Tribune has been covering the event and below you can find a link to a few of the articles and player spotlights. Thursday, June 14: "Kim Mizuno and Nancy Gray make a song trek to compete in tennis tournament"
Tuesday, June 12: "Cancer survivor thriving on and off the court"
Slaughter Roofing is a proud sponsor of the American Cancer Tennis Tournament. Help us hammer out cancer by joining us on June 11-16 at the Centennial Tennis courts in Greeley, Co.